Over two winters, researchers looked at the movements of grey wolves near Fort McMurray, Alta. in conjunction with data on snowfall in the area. They found the animals changed their movements on snowy days. When snow falls, wolves chill out, according to a recent study from the University of Alberta. Over two winters, researchers looked at the movements of grey wolves near Fort McMurray, Alta. in conjunction with data on snowfall in the area. "We found that on the night that it was snowing, wolves rested more than they travelled, and when they travelled, they travelled slower than on other days when there wasn't any snowfall," Amanda Droghini, a former master's student with the biology department. The researchers also found that within a day of the snowfall, the wolves returned to their normal movement behaviours. 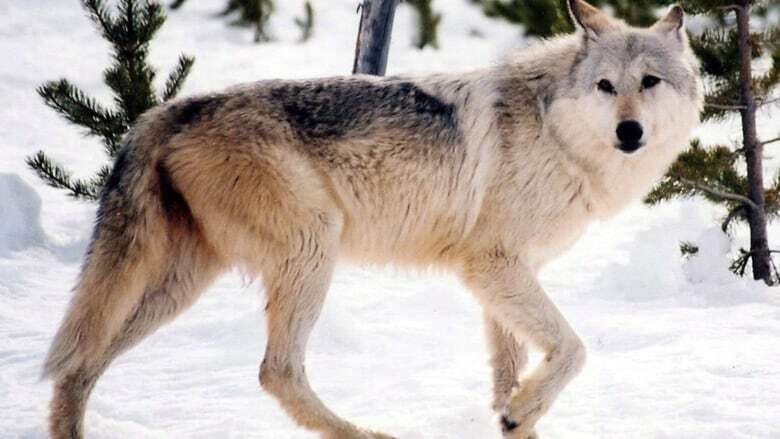 They don't know exactly why the wolves changed their movements, but they have some theories. "We think that it might be something about actively falling snow," said Droghini. Snow, like rain, clears the air of scent molecules, she said. Wolves rely heavily on their sense of smell to hunt, especially at night. Most of the wolves studied do their hunting after dark. Another possible explanation, said Droghini, is that the wolves' prey move less in falling snow. "We unfortunately don't have the data to test this," she said, but if other animals are hunkered down, waiting for the snow to stop, there is no incentive for the wolves to go out hunting. The researchers used data from remote cameras that monitored snowfalls, and collars on 17 wolves. These wolves were also part of a separate study that looked at the movement of wolves and moose near Fort McMurray. It's hard to say right now how climate change might affect the behaviour of wolves in snow, said Droghini. Information about snow conditions is scarce, particularly in the North where there aren't many weather stations. Droghini said more freeze and thaw cycles could make movement difficult for animals in winter. Rain after snow can create an icy crust over the snowpack, and this kind of snow is the most challenging for animals to walk through, she said. "It costs them a lot of energy." The concern, said Droghini, is that it might be more difficult for animals to maintain the energy levels they need for the reproductive season.